Bordertown is not just a physical place, but a philosophical one. On an appropriately dark and stormy night, nine characters held hostage in a diner are stranded on the border between safety and danger, between life and death, fate and chance. Can they get out alive? Nine people are stranded in a diner on tornado-ravaged night, and the diner becomes a safe haven for a motley crew of small-town characters: the cop, the waitress, the escaped convict, etc. The construct is full of possibilities -- a Breakfast Club scenario where social groups long torn apart finally mix, a chance for long time friends to admit their love, or a Lord of the Flies "everybody tries to kill each other" fest? 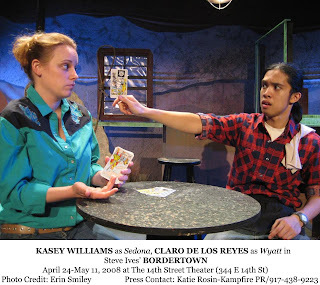 In this case, Bordertown by Steve Ives tries to be both. The endless conflict keeps the play moving briskly, but also makes it hard to focus on any one storyline. Anything can happen, and that’s part of the problem. The set is a classic diner, with a huge jukebox, bar counter with plastic pie cases, and a neon sign whose letters slowly burn out until the only ones left are D-I-E. Lights rise on Sedona (Casey Williams), the diner’s cute waitress, who wears tight jeans and boots, likes to play with tarot cards, and has a stream of wisecracks as constant as the coffee she pours, and Wyatt (Claro De Los Reyes) the thoughtful busboy with intense, dark brown eyes who believes in ghosts and was abandoned by his mother as a baby. They fight with George (Michael Bertolini), the sort of boss who screams at his employees to get back to work, even when there's only one customer in the diner, a slight, white-haired man named Hank who insists on asking everyone he sees if they are “him.” It’s a sign that something isn’t quite right in this house of pie and coffee, more so when practically half the town comes in to get out of the rain. One of these strangers is Little Mick (brightly rendered by Michael Kingsbaker), a mobster’s lackey, keeping with the classic theme with his fedora, sharp suit, and Brooklyn accent. Both coffee and plot are boiling as it's revealed that George isn’t the upstanding restaurant owner he claims to be: he owes a gambling debt to the mob boss, and it’s Little Mick’s job to collect. Mick is hilarious in his attempts to be both street and book smart, quoting Dostoyevsky and referencing Greek mythology just as readily as he threatens to break everyone’s balls. More danger arrives in the form of Miles (Andrew Schecter) and Otto (Cary Hite), two escaped convicts who hold the diner hostage (as if the tornado weren't enough). Schecter tires to hold all of his nervous energy in check, but his jerky movements, nervous fidgeting with the gun, suggest a criminal on training wheels, interrupting his own threats, swinging the gun aimlessly, always on the verge of tears. In stark contrast, Otto does not speak, but the movements of his eyes, and tightening of his mouth in anger as he wields his gun suggest a reservoir of hidden emotion. There’s also a funny, if tasteless physical sight gag, involving the man who comes to check the meter, and a strange physical condition that results in spontaneous orgasms every time he hears the name Hilary Clinton. Did I mention he’s somehow involved with planting a bomb? Apparently it’s not enough that there’s a tornado, mobster, a hostage taker, and a strange older man. As in many movies and plays involving near-death experiences in cramped quarters, the fear of death is incentive for people to relieve themselves of their secrets, to answer as quickly as possible all of the questions about whether it was fate that brought them together or just a coincidence, or whether their life was worth anything, whether they will go to heaven or hell. The life stories are told in expository monologues rather than through dialogue, which gives the actors some room to shine individually, a challenge in such a busy plot. The physical staging is another bright spot, and complements the feeling of being trapped, as the cast members elbow each other, while trying to shift their chairs, straining for physical independence, even as their emotions are being held hostage by Miles and his gun. Soon enough, both the storm outside and the man-made one inside blow over, and the inhabitants are free. Will they still be friends after the chaos of the night? Will Sedona go to Mexico with Otto and Miles? Will one of the town’s cops, who was among the stranded, arrest Little Mick or Otto and Miles? Everyone is intact physically, but the play could have dug deeper to show, or at least raise the question of whether the experience changed them in any way, whether they really did have any revelations, or whether they can just go about their business as usual, invulnerable and jaded, relieved to be alive, but unchanged. Bordertown is playing at the 14th Street Theater: 344 East 14th Street, 2nd Floor. Performances are Tuesday-Saturday at 8pm. Tickets are available at theatermania.com or through the 14st Theater Box Office.